Gruyère and Carrot Timbales, Tomato Sauce, Thyme for Cooking gourmet starter for two. 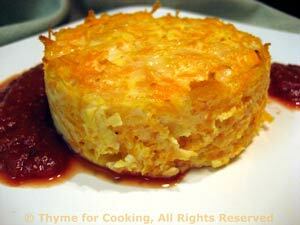 Shredded carrots and Gruyère cheese combine to make an interesting timbale for a first course. The carrot retains a light crunch, and the sweetness pairs well with the slightly sharp cheese. A bit of tomato sauce is all that's needed to finish. Using drained canned tomatoes give the sauce a much fresher flavor than using regular tomato sauce. Butter two ramekins and line the bottoms with buttered waxed paper (makes getting them out much easier). Put a medium saucepan half full of water on medium-high heat. Grate carrot first, then cheese, using the fine holes of your trusty box grater. Keep them separate. When the water is boiling blanch the carrots for 30 seconds, drain and rinse with cold water. Using your hands gently squeeze them dry. Add carrots, cheese, mustard, milk and mix well. Put into a roasting pan with deep sides - I use a metal bread pan, and add hot water (hot tap water is fine) so that it comes half way up the sides of the ramekins. Bake for 25 minutes at 400F (200C) - they should be set - firm on top. Run a table knife around the sides to loosen. Turn timbale over. Spoon tomato sauce around half of timbale and serve. Roughly chop the tomatoes and add along with the rest of the ingredients. Purée (either with a blender or immersion blender) and serve on the side.